Early voting at Prairie View A&M University in Prairie View. Photo by Rachel Zein for The Texas Tribune. Four years after Texas ranked near the bottom in voter turnout in the country, the state saw a double-digit percentage point increase in that figure for the 2018 midterms. But that wasn’t good enough to get Texas out of the bottom half of states, as it still lagged behind the national average and trailed all but 10 states this year, according to the United States Elections Project, which tracks the turnout rate of eligible voters nationwide. Voter turnout in the 2018 Texas midterm elections increased by 18 percentage points compared with the previous midterms, the country's sixth-highest increase. Nationwide, turnout increased by 13 percentage points from 2014 to 2018. Out of the voting-eligible population in Texas, 46.3 percent voted in 2018. Nationwide, turnout was 50.1 percent. “Texas simply has not had particularly competitive elections, and the change in competition made a difference this year,” said Michael McDonald, a professor at the University of Florida who runs the United States Elections Project. This year, “campaigns had a reason to be engaged, and money flowed to the competitive races, which funded ads and in turn mobilized voters. Everything feeds on itself when there’s a competitive election,” McDonald said. To calculate turnout, McDonald divides the total number of ballots counted in a state by that state’s voting-eligible population instead of using more common metrics such as the voting-age population or number of registered voters. McDonald calculates the voting-eligible population by taking the voting-age population — everyone who is 18 or older — and adjusting for noncitizens and felons ineligible to vote in that state. “The voting-eligible population makes it easier to make comparisons across states and across time because the way states manage registered voters differs quite a bit,” McDonald said. Low turnout has historically plagued Texas in part because of uncompetitive races at the top of the ballot. In 2014, when Republicans John Cornyn and Greg Abbott won their respective races for U.S. Senate and governor by over 20 points, just 28.3 percent of eligible voters cast a ballot, among the worst in the nation. In 2018, Democrats fielded candidates in every Texas congressional district for the first time in well over a decade. They were boosted statewide by U.S. Rep. Beto O’Rourke’s spirited bid to unseat Republican U.S. Sen. Ted Cruz. O’Rourke — whose bid garnered national attention — fell short by less than 3 percentage points. Yet Democrats flipped Republican-held seats in the U.S. House, the Texas Legislature as well as lower on the ballot. 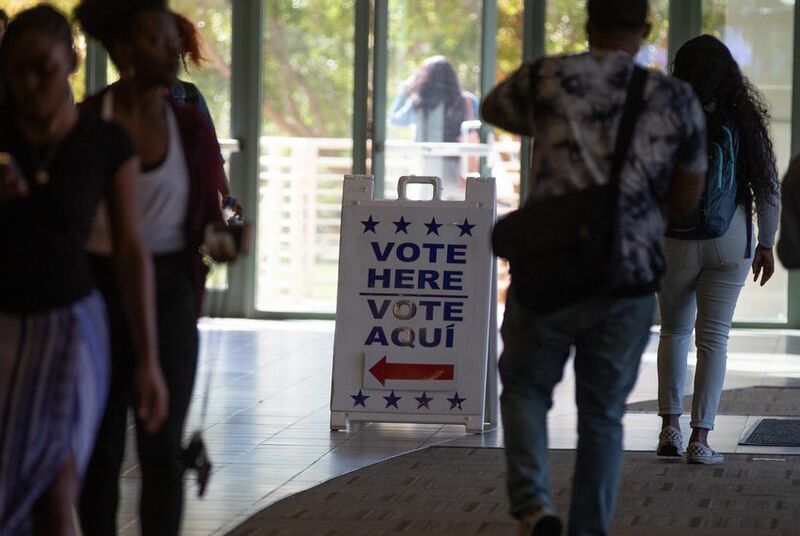 Other factors that have contributed to Texas’ low voter turnout over the years include demographics, McDonald said, and in particular the state’s large Hispanic population. Hispanic residents tend to be younger — a third of the state’s Hispanic population isn’t of voting age — and everyone under 40 is less likely to vote. Immigrants also make up a large share of the Hispanic population, and they either cannot participate in elections or, if naturalized, tend to be less politically engaged. But demographics don’t tell the whole story. Texas voters have one of the earliest registration deadlines in the country, and they cannot register online. The state’s voter ID law requires a photo ID to cast a ballot or, in the absence of one, requires a voter to provide proof of residence and sign a form swearing a “reasonable impediment” that keeps them from obtaining a photo ID. Still, Texas has two weeks of early voting, which McDonald says does facilitate higher turnout. This year, early voting alone surpassed total turnout in the 2014 election and accounted for over 70% of total turnout in Texas. It remains unclear if the increase in turnout in this year's midterms was due mostly to a competitive U.S. Senate election or a larger trend of civic engagement in Texas. But McDonald is hopeful. He predicts that recent and ongoing mobilization drives will produce a snowball effect. “If you vote once you’re much more likely to vote again, and voters will be more engaged over time,” he said.